We Design, Develop & Maintain Web Sites. 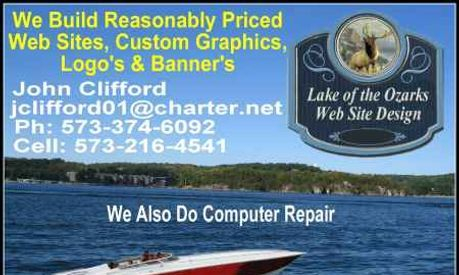 We service the Lake of the Ozarks area as well as the Midwest, including Kansas City. We will help you design & develop a Web Site for your Business, Church, Organization or A Personal Site. We offer a Professional Web Site at economical prices. We can Design Personalized Logo's, Graphic's & Banners for your Web Site. We can help you develop your site & maintain it for you or we can teach you how to maintain the site yourself. If you are fairly computer literate & have the basics of word processing, we can easily teach you to maintain the site. Prices are very affordable & vary with the number of Pages, Graphic's Ect. We will be glad to meet with you & discuss development & cost. We give true personalized service.